Teak (Tectona grandis Linn. f.) ranks among the top five tropical hardwood species and is being promoted for use in plantations in its non-native range due to its high economic value. However, there is a general lack of data on ecosystem functioning of teak plantations. We aimed at understanding storage and flux of nutrients related to young plantations of teak. 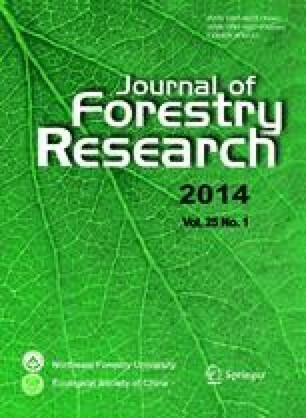 Cycling of nitrogen (N) and phosphorus (P) in a chronosequence of plantations (1, 5, 11, 18, 24 and 30 years) was studied in the Moist Deciduous Forest Region of North India with the objective of investigating the nutrient cycling pattern at younger age since the current trend of harvesting age of the species in several tropical countries is being drastically reduced for quick return from this high value crop. Standing state, nutrient uptake, nutrient return and nutrient retranslocation in these plantations were estimated by tree harvesting and chemical analysis methods. The range of total standing nutrient across all these plantations was 20.3 to 586.6 kg·ha−1 for N and 5.3 to 208.8 kg·ha−1 for P. Net uptake of N ranged from 19.4 to 88.9 kg·ha−1·a−1 and P from 3.8 to 18.1 kg·ha−1·a−1. Retranslocation of N and P among all the stands ranged from 8.7 to 48.0 kg·ha−1·a−1 and 0.01 to 3.5 kg·ha−1·a−1, respectively. Range of total nutrient return was 25.8 to 91.3 kg·ha−1·a−1 for N and 2.7 to 10.1 kg·ha−1·a−1 for P. N and P use efficiency was between 107.4 and 192.5 g dry organic matter (OM) g−1 N, and 551.9 and 841.1 g OM g−1 P, respectively. The turnover time ranged from 2.04–13.17 years for N and between 2.40–22.66 years for P. Quantity of N and P in the soil nutrient pool ranged from 2566.8 to 4426.8 kg·ha−1 and 372 to 520 kg·ha−1, respectively. Storage and flux of components in different plant parts of different aged plantations were assessed and depicted in compartment models. Percentage storage in soil, litter and vegetation ranged from 82% to 99%, 0.6% to 2.4% and 0.5% to 15% for N, respectively, and from 63% to 98%, 0.5% to 2% and 1% to 35% for P, respectively. This information could be useful in managing external nutrient manipulation to crops of different ages for optimum biomass production or carbon sequestration.